Grass Tent-only pitch measuring 8m x 8m with 16amp electrical hookup. Suitable for a single tent only - your tent and car must be contained within the pitch dimensions. All caravan and camping pitch guests also have use of all our fantastic on-site leisure facilities. Pitches will be available from 2pm on the day of arrival and must be vacated by 11am on the morning of departure. For health and safety reasons and to make sure everyone has a pleasant stay at Whitemead Forest Park, we ask that all pitches are used in line with our pitching instructions and Terms and Conditions. To find out where in the Park the caravan and camping pitches are you can view the site plan. We are happy to take requests for specific pitches however, these are requests and cannot be guaranteed. A. Pitches are available from 2pm on your arrival date and must be vacated by 11am on your day of departure. Early arrival and late departures may be available at certain times of year (extra charges may apply). Q. Is there a minimum stay? A. 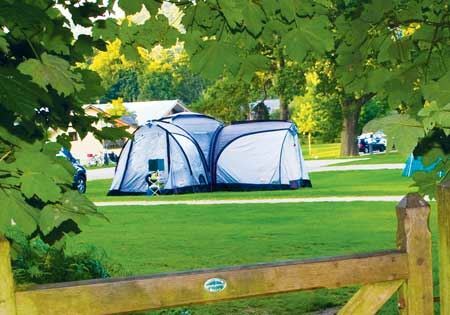 For caravan and camping pitches there is a minimum stay policy of 2 nights on weekends, or 3 nights during school holidays or on bank holiday weekends. A. Pitches may be occupied by a maximum of 6 persons. A. Dogs are permitted, to a maximum of two per pitch. There is no extra charge for the first dog, however a daily charge of £3 is applied for your second dog.